There is nothing better than a new baby. Especially when it’s a new nephew! 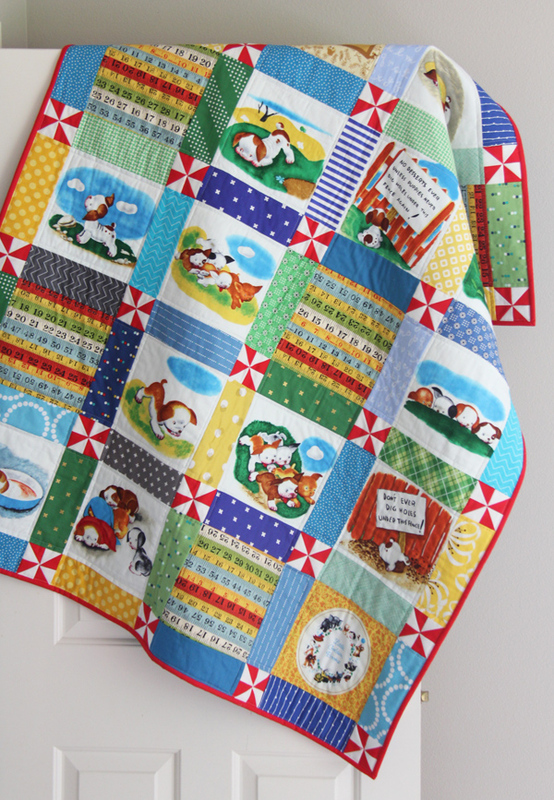 My sister in law loves Little Golden Books and purchased a Pokey Puppy panel she wanted made into a quilt (I couldn’t find a good link for the panel but you can Google it and there are some options). 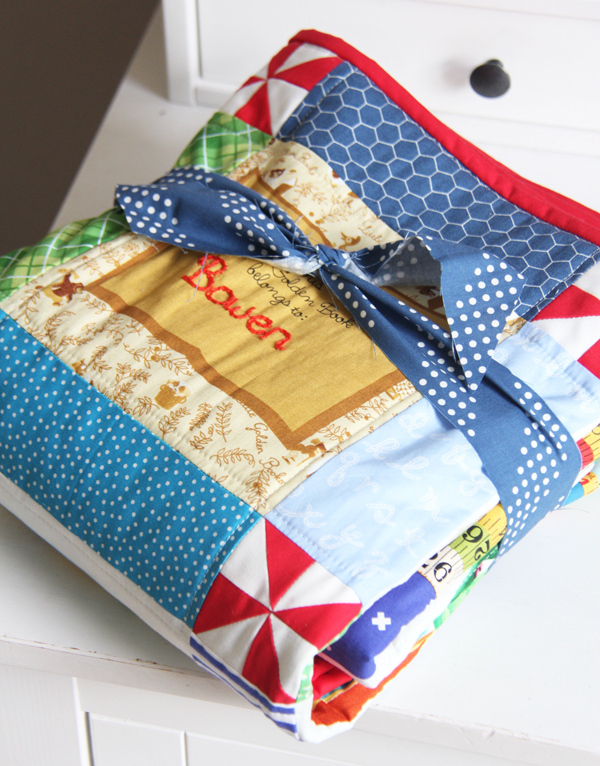 The panel is really made to be a fabric book, but it also works great for a cute baby quilt. It was a great challenge for me! I cut the blocks 7 1/2″ square out of the panel, and added the 3″ pinwheels and 3″ x 7 1/2″ sashing strips to make it a nice crib size. It has minky on the back and a warm batting, so I quilted it with simple straight lines. There wasn’t enough book blocks for the layout, so I added the ruler fabric (an out of print Moda fabric) to fill in the extra spaces. Before sewing the quilt top together I added his name to one block with an easy loop stitch. It was such a fun quilt to make for baby Bowen. Also he smells like a newborn, and I miss having a newborn! The pinwheels add so much to this quilt. Beautiful! Too cute. I loved the Pokey Puppy book. Great use of the panel. I really love this quilt. It is sooo cute. My grandson lived with me and this was his favorite book. Cute, and the baby’s adorable, too! Adorable…both the quilt and the baby…love those red and white pinwheels! Thank you! You can’t go wrong with red pinwheels! I love that so much more as a quilt than a fabric book (a fabric book… why???) – it’s absolutely adorable! I just bought that book for my niece – family tradition :D Love, love, love! I remember reading that book to my children. I also love the ruler fabric. Oh the new baby smell………….intoxicating! 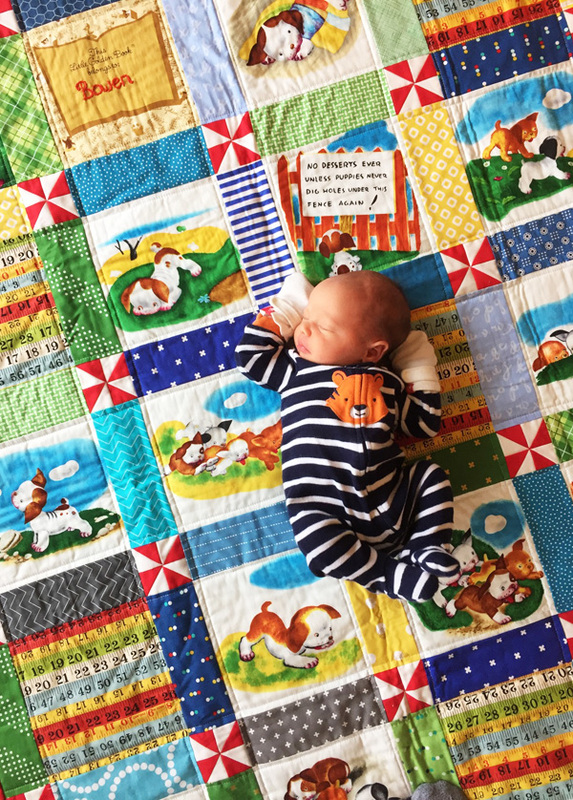 Such a sweet quilt and such a sweet little nephew! Oh I love that how fun! I’ll give him a squeeze for you! Cute quilt, gorgeous baby but what’s with the,weird name? Never heard it! I have a friend who’s baby is named Bowen but she is a girl. We have a Bowen island here though so I figured that was the inspiration. I think its a great name! Different but still sounds like a name. This is such a cute baby quilt with all the panel blocks. Bowen is such a sweet newborn too – really adorable!! You did a nice job. Good colors. He will cherish it. Love it! I had someone make a quilt for my son out of panels from a Curious George book like this. I almost tackled it on my own, but at that point it would have been my first quilt and I chickened out. I love the variety in the sashing and the pinwheels. Makes it a fun quilt, one that he will like even when he is older! Beautiful…..beautiful…….the baby AND the quilt. What a Lovely gift. I absolutely love your quilts. Oh I love that! I’m so glad it brought back fond memories! 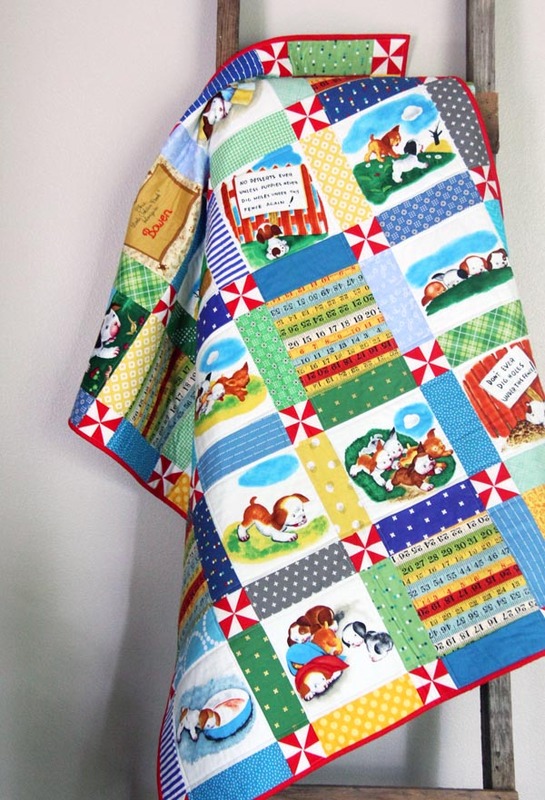 It’s the perfect quilt – for a perfect little one…..I love this! Love, love, love this quilt! I look at all the quilts that come in my email, but don’t often stop by to comment. So I just want to say, while I am here, thanks for sharing all these beautiful quilts. I don’t have a lot of extra time to quilt right now, but I hope one day I will be able to make some of these amazing looking quilts. Is the Pokey Puppy fabric hard to find? Maybe that is just why this quilt is so appealing. I love the pokey puppy story. Used to be a favorite to read to my kids. You are sweet to take the time to hop over and comment! I did a quick google search of “Pokey Puppy fabric book panel” and some good options came up, it was a fabric panel I cut up! Oh, I love the Pokey Little Puppy book too! And what a great idea to use the panel…the quilt is adorable! How very clever and imaginative to make the fabric book panels into a quilt. I think this is the cutest baby quilt ever!! !It is why I love opening your emails!!! I’m always glad when you still love opening my emails! I always wonder if it bugs people LOL. How adorable! Love the little red/white pinwheels in the sashing! And it’s fun to see a familiar fabric – just used the measuring tape print in some ‘tool’ t-shirt quilts. That ruler fabric is my favorite!!! Absolutely adorable!! I love the Pokey Puppy and the ruler fabric is perfect with it. What a quilt to cherish! This is a beautiful quilt! I bought that panel with the same thing in mind, but as I am very much a novice quilt maker I never could get it to come together enough in my head to even try it. You did an amazing job of figuring everything out and the colors you used in the sashing strips and those darling little pinwheels just added the pizzaz it needed without taking away from the illustrations. Thanks so much for sharing. Great minds think alike! If you ever need help figuring out a way to use it email me! Thanks for sharing! I love this quilt. I’ve got to buy one of those panels. What a sweet quilt for a sweet little one. I still have some fabric books from my now -grown children. I was saving them for my hope-to-have grands but now think I will use them for quilts. And for the commenter who asked “why fabric books?” Babies love to chew on everything, these fabric books are a good introduction to reading and are considered a toy which goes everywhere so it needs to be washable. This is a precious baby quilt and the baby is equally as precious. Thank you for sharing it and all the others with us. You have such a way with color, Allison! Bless your Buttons! This turned out great! Love the addition of the red and white pinwheels. Your make gorgeous stuff!! Super cute!! I have the panel too I was supposed to make the book two years ago for my daughter 😁 But thank you for the idea!! What a sweet quilt you made! Golden Books are the best! Love the embroidered name you added…great idea with the panel! Loved your version of the Pokey Little Puppy quilt. The pinwheels add a spark to it. I have the panel but have been clueless how to put the book into a quilt–your version truly inspired me! Thanks for posting this: I must get busy on mine now!! I’m so glad Julie! Happy sewing! I love your Pokey Little Puppy quilt. I still have my book from when I was a child (many years ago) and it was one of my son’s favorite books too. I am going to try to find that panel. Wow! Great imaginative use of the book panels! And those pinwheels make the quilt. A+! Just love it! This is a great quilt! I love this book also, but I love love love the way you used the panels. The bright strips and pinwheels in between each panel make it adorable! Baby Bowen will enjoy this for many years! Adorable! All your quilts are and thanks for sharing your tips, etc – always enjoy your posts! Your Quilt is so adorable, very pretty. I dearly love this Quilt. As others said, I have this panel, but couldn’t figure out how to put it into a quilt. Thank you for your ideas! That is so gosh darn cute. Makes me want to go out and find a baby to sew for! Absolutely ADORABLE!! Your nephew is one lucky kiddo! Hi Kim! If you scroll through the post I think I say they are 3″ pinwheels, and I give the size for the strips too. Thanks! 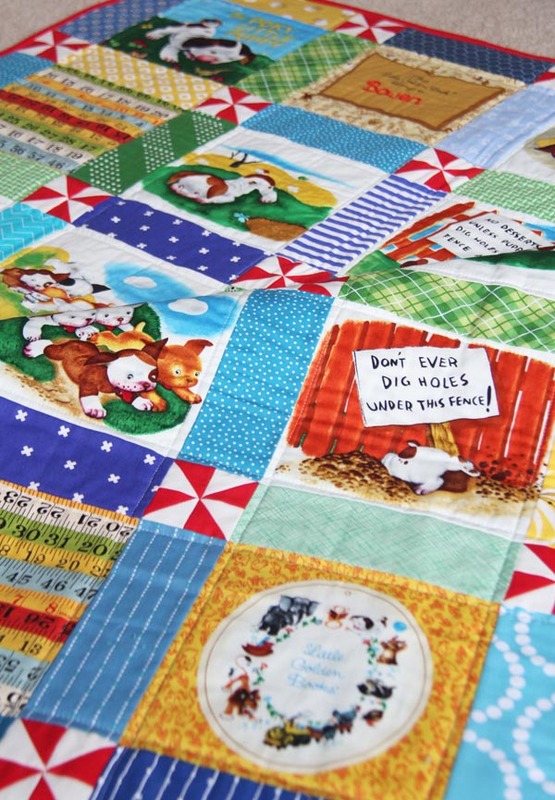 Ive just seen your Poky Little Puppy quilt and have fallen in love with it. Do u know if you can still purchase this panel? I’m wanting to make a cot quilt for my grandson and would love to do this one. I’m trying to find some poky little puppy fabric panels and I cannot find any. Does anyone know where I can get some? I’ll do some searching but they are probably really hard to find now! I just found this quilt while enjoying the look at all the ones before it on your post. I bought two pokey puppy panels and some golden book fabric a long time ago. I did make a book for a shower gift when we were asked to bring a book instead of a card. I love this quilt so much more. I guess there’s a reason why I didn’t sew the other book. Now I just need a baby to come along to claim it.